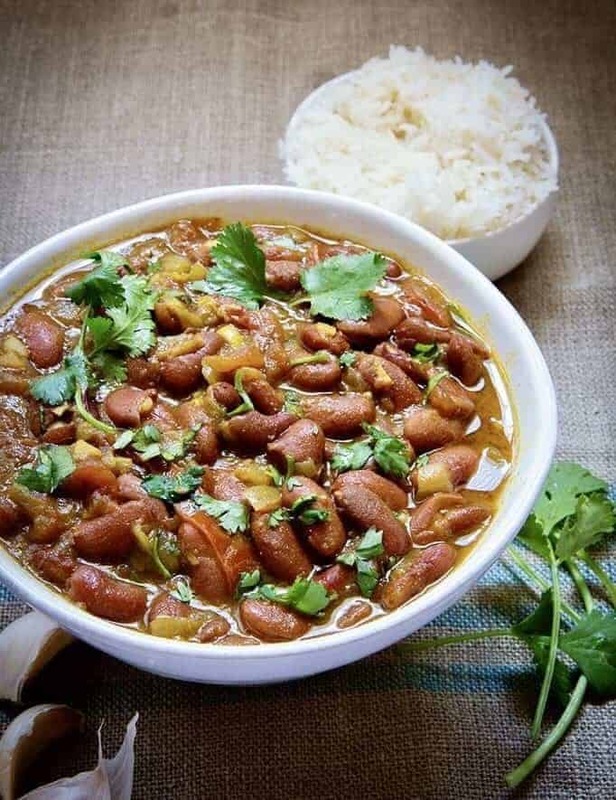 Every Punjabi household has their own version of Rajma, and nothing says comfort food like Rajma Chawal or Red Kidney Beans with Rice. It’s what you cook on a day you’re tired, couldn’t be bothered to cook too much, and are pretty much out of ideas anyway. This dish is made considerably easier if you already have the Onion Masala at hand but I’ve written this recipe in a way that you don’t have to have it. We’re going to make the masala and the beans simultaneously by using Pot-In-Pot cooking, as we did when we did the PIP Chana and Rice cooking. 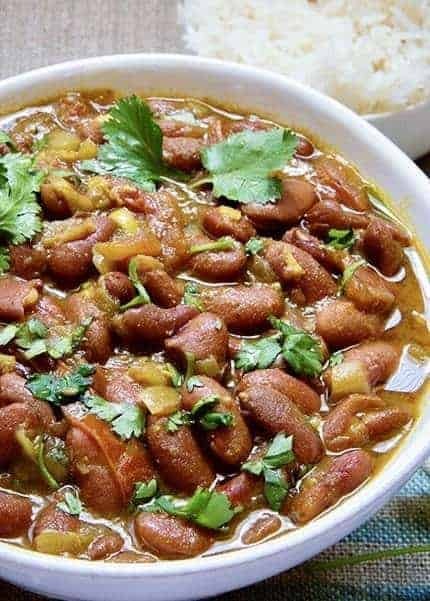 Instant Pot Rajma Red Kidney Beans. A creamy, hearty, nutritious vegetarian Indian dish that cooks in your pressure cooker in 30 minutes. Enjoy this classic Punjabi dish at home. Place all ingredients for the onion masala into the inner liner of the Instant Pot. Place a trivet on top of this masala. In a heat-safe bowl, place the red kidney beans and 2 cups of water. Cover the bowl with foil. Place the covered bowl on top of the trivet. Seal the Instant Pot. Press the BEAN button to cook for 30 minutes and let it naturally release pressure for 10 minutes. Open the Instant Pot and remove the red kidney beans and the trivet. Slightly mash about half the rajma with the back of your spoon. Turn the pot onto SAUTÉ (high). Pour the rajma and any remaining water in with the onion masala and mix well. Let the contents come to a boil to meld all the flavors well. Made this yesterday. Absolutely fantastic! Made it without any changes. Thank you for all your ‘working-people-friendly’ recipes. Loved the chana masala too. Can I use canned crushed tomatoes instead of diced? I just made this and I love it! So easy, so much flavour! Thank you for this recipe. It might be the first of your recipe that I tried, but it certainly won’t be the last. I made this last night from the book, and while it was amazing and delicious, I had to cook the beans for a full half hour longer. I noticed the recipe here includes a 1 hour soak in hot water, so I guess I should try that. Otherwise, it’s an amazing recipe. I had exactly the same experience. Very frustrating. I wish the cookbook version of this recipe had included the fact that you have to soak the beans first. This version of the recipe also calls for half the salt of the cookbook version — good news, as the cookbook version was way too salty. If you have already made and frozen the onion masala, how much do you need to defrost for this recipe and when would you add it to the beans? Thank you! We love your cookbook! Once the beans are already cooked? Thank you so much!! Yes that would be the way to do. 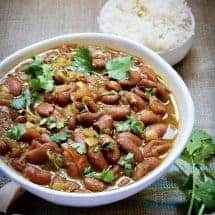 How would I modify the recipe if I use canned rajma instead? Hello! I’m making this tonight for dinner! What other Indian,veggie dishes would compliment this well?